Title: "Murmur of the heart..!" / "Heart to heart" / "Heartbreak!" / "Heart attack"
This mini-series makes some pretty incredible revisions to both Jack of Hearts and, even more incredibly, supporting Peter Parker character Marcy Kaine. 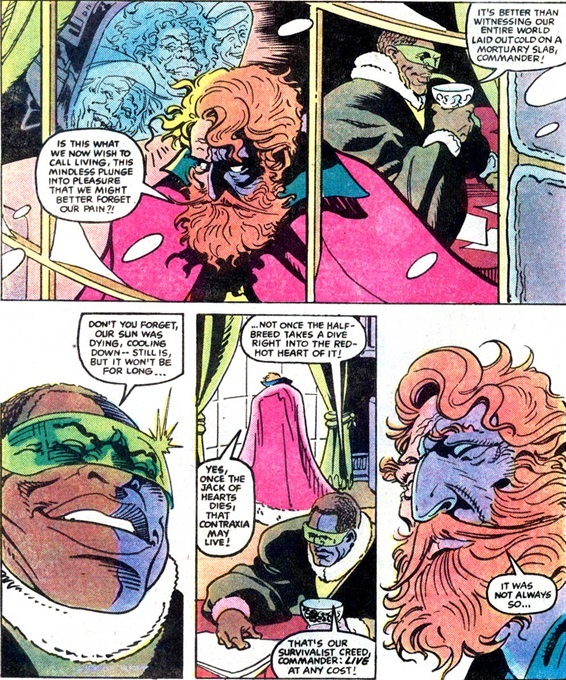 It really seems like Mantlo was making things up as he went along. 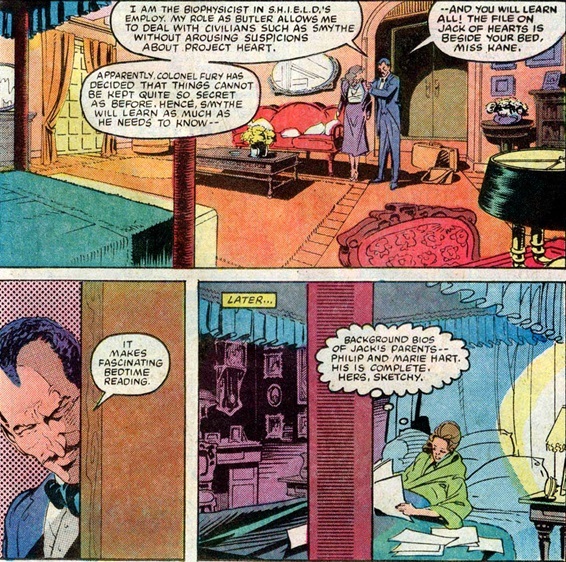 In Marvel Team-Up #134, where we learned that Jack had a history with Marcy, there's no indication that Marcy suspected anything about Jack, and is shocked to see him exhibit super-abilities. When she shows up here (after waiting to graduate from school first! 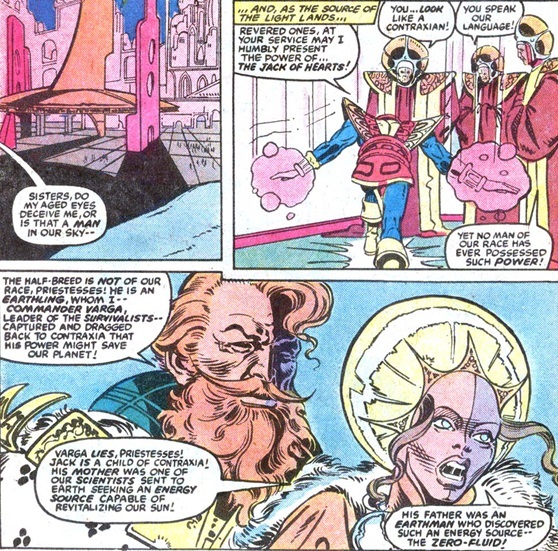 ), there's still nothing in issue #1 to foreshadow the fact that she's an alien. ...which is the first indication that Jack is actually an alien, but nothing that says to me that Mantlo knew where he was going with Marcy. But by issue #2, she is revealed as being a Contraxian, the same species as Jack's mother. ...also shows no sign of really being an alien until issue #2. Anyway, what we learn in this series is that Jack of Hearts' mother is actually an alien, and her race all has the black & white split face like he does. So the accident that gave him his powers was actually more of a catalyst than a true freak event. Jack's mother was on Earth because his father was on the verge of creating some new energy source that the Contraxians needed because their sun is dying, and then she fell in love with him, and it all ended with the explosion that gave Jack his powers. The Contraxians have a pacifist code, but a Survivalist faction shows up to force Jack to go to their planet to be sacrificed. Jack drives them off, but then agrees to go with Marcy anyway. Jack agrees to help the Contraxians, but the Survivalists still don't believe him and so queue the back-and-forth fighting. Jack eventually manages to restore the Contraxian's sun without dying, and then he flies off, leaving Marcy behind. ...but they wipe their hands when Jack leaves the planet in issue #2. George Freeman didn't do much for Marvel besides this. It may just be because of the character designs, but i think i see a bit of Keith Giffen in his style, although it's more free-flowing and, to my eyes, messy looking. It also has a vaguely early 90s look in the sense that it deviates from Marvel's clean 1980s house style, so i guess it's ahead of its time? Turning Marcy Kane into an alien is a bewildering move. She's a minor character, to be sure. But there was a running gag with her during Roger Stern's Peter Parker run where she kept showing up with different wigs and hair coverings. And the big gag reveal was just that she wasn't a natural blond. It was just supposed to be a joke. 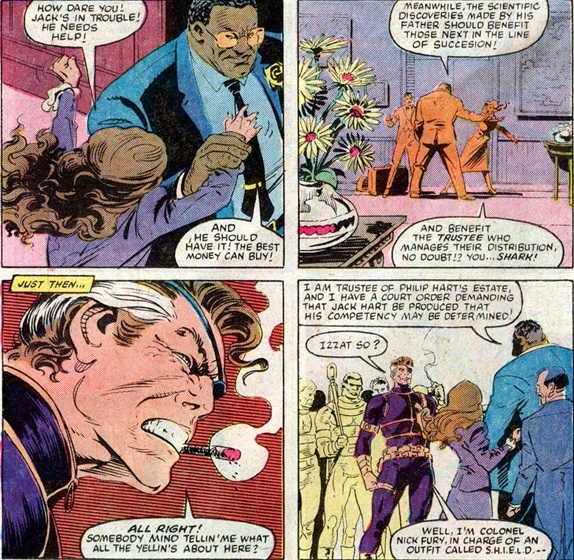 Now (as Gary Himes' comment below shows; in fact when i only had issue #2 of this series it took Gary's comment to make me realize this was supposed to be the same character) we have to wonder if there wasn't something more significant behind that (although it certainly wasn't Roger Stern's intention). Beyond that, Marcy, as a straight-laced no-nonsense student focused on her studies, was a nice foil for the often overwhelmed Peter Parker. As a whole, the series is just kind of there. Freeman's art is unique enough for the time period. But storywise, Jack of Hearts goes to save some other planet and who cares? 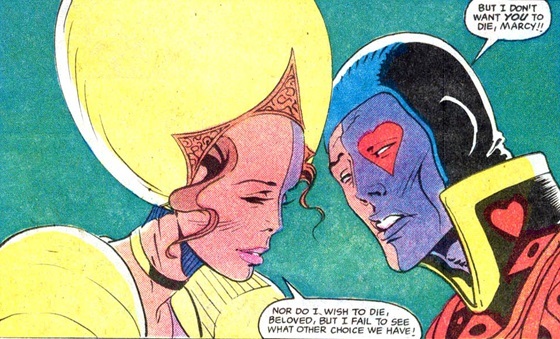 Plus there's the usual Bill Mantlo angst all the way through. 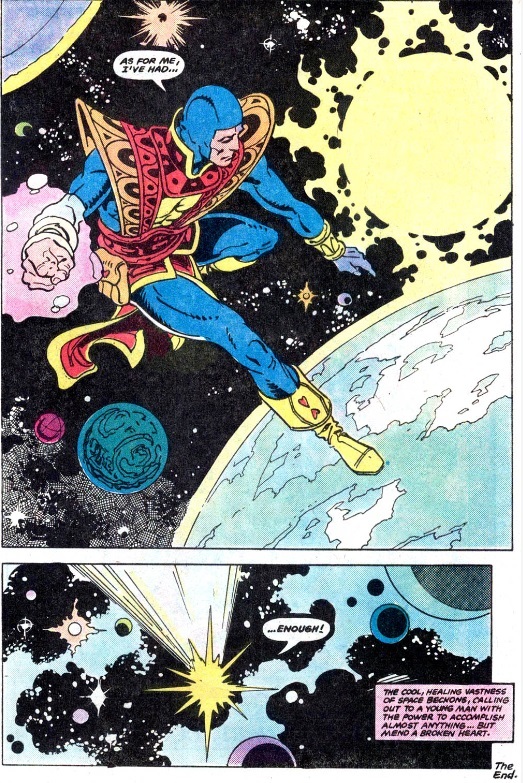 Despite that, though, making Jack of Hearts an alien did make it possible for him to be revived in Quasar and then take a place among Marvel's "cosmic" characters. 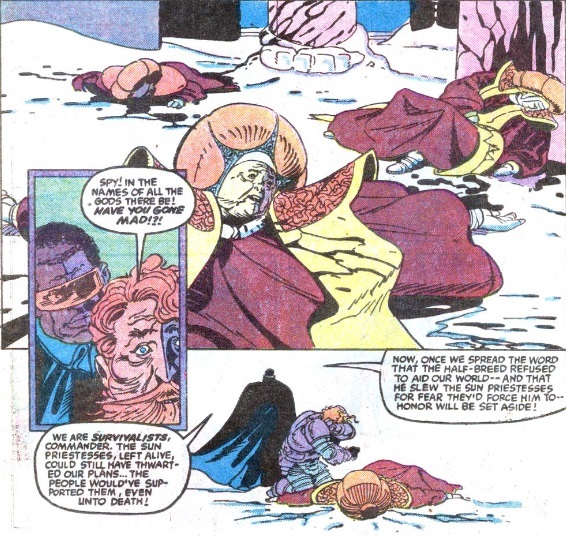 So even though it was painful to get here, and even though Mantlo himself didn't get to see it realized, this mini-series did ultimately ensure that Jack would continue to appear from time to time (even after his (second) death in Disassembled). Historical Significance Rating: 2 - revisions to Jack of Hearts' origin. Revelation that Marcy Kane is a Contraxian. 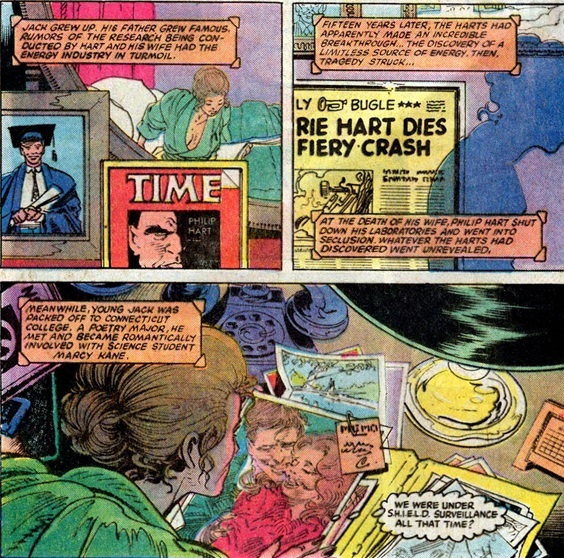 Marcy Kaine first appeared in Peter Parker, the Spectacular Spider-Man #32. 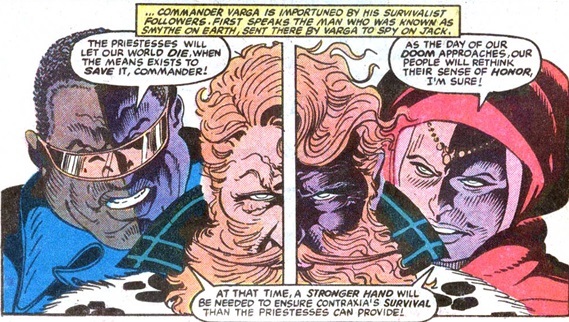 We learned that she had a connection with Jack of Hearts in Marvel Team-Up #134. 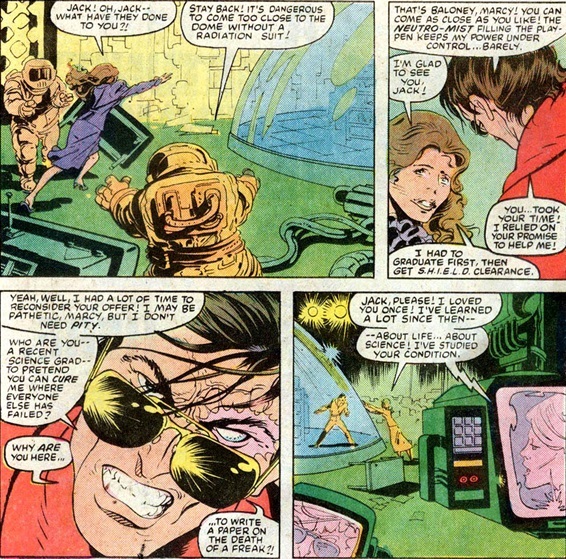 At the start of this series, SHIELD was holding Jack in an energy dampening dome originally designed for Nuklo, as shown in Vision and the Scarlet Witch #2. His first appearance fighting the White Tiger in Deadly Hands of Kung Fu #24. 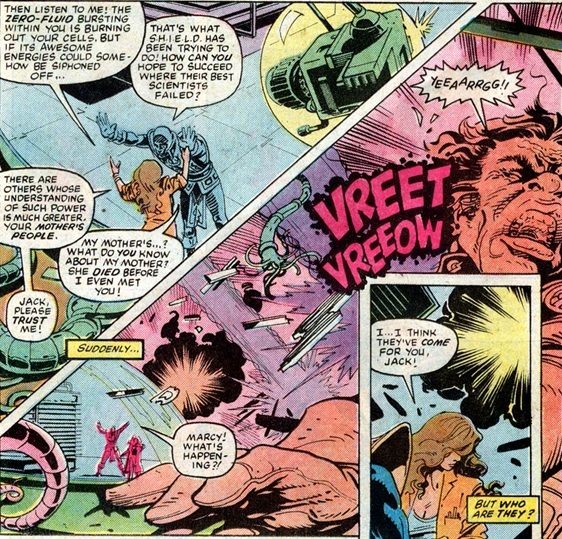 His fight with the Hulk in Hulk #214. Becoming a trainee under Iron Man circa Iron Man #109. 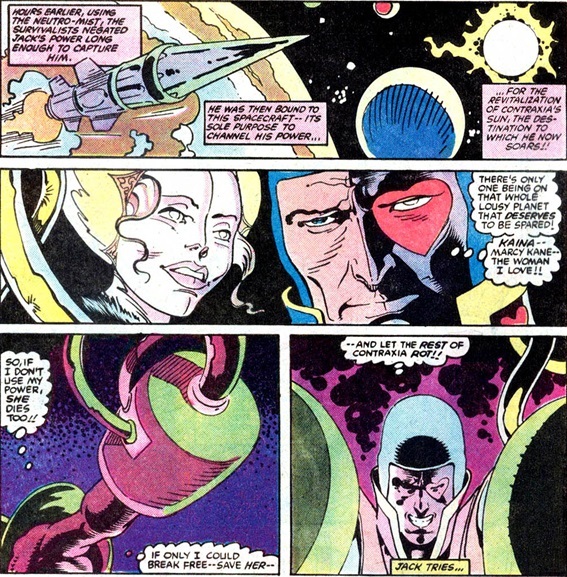 Encountering Hemlock in Marvel Premiere #44. According to a Fred Hembeck page, Jack of Hearts never became a big hit for Marvel because the artists banded together and refused to draw his overly detailed costume. I've always found it bizarre that Marcy Kane who obsessed over her hair color over in PPtSSM actually turned out to be an alien in disguise. Maybe they should've retconned it by saying her hair was returning to it's natural split-color and she was trying to cover it up? George Freeman was previously a Canadian artist/colorist known primarily for his work on Captain Canuck. Freeman's style reminds me a lot of Steve Ditko, with a touch of P. Craig Russell thrown in for taste. What? Marcy Kane was an alien? Such a shame to give her a clunker like this since I liked the character.